Technological innovation, Revolution, Breakthrough. 2018 Pershing 82 cannot be described better. It is indeed an ideal combination of luxury and comfort and its high-end interiors adds to the beauty of this fantastic motor yacht. For such a classic boat, you have to make sure your nights are also as comfortable and relaxing as your daytime and that’s where you need to make the right choice. A good mattress is crucial to a good night sleep. For this Pershing 82, our client wanted the best so we offered him the best. Our custom 9” Admiral Latex pillow top mattress. It is constructed with a super comfy 6” (medium) Latex core. We then add 2” of ultra-soft latex Pillow Top and cover it in the plushest of bamboo quilting. The result is truly The Leader of the Fleet! The benefits of a latex mattress include being mold and mildew resistant, extremely comfortable, latex helps regulate body heat, which allows you to sleep cooler, and it will not absorb smells. If you love a plush mattress, then the Admiral is for you. If you are interested in memory foam, you should try our Admiral 9” Memory Foam pillow top made with 2” of 5lb memory foam on top of our firm latex core. All our mattresses and mattress toppers are made custom according to the specific size and shape of your bed. If you are not a fan of pillow top then try our Commodore. 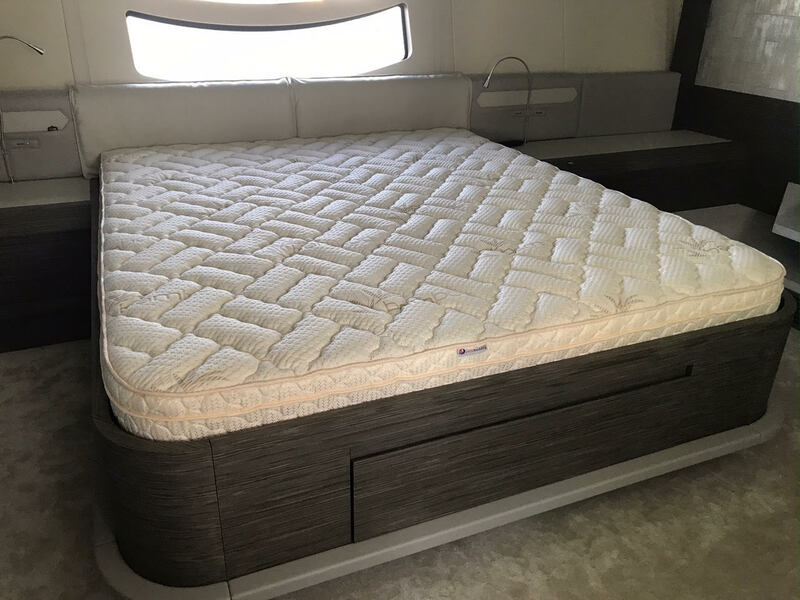 Constructed with a 6″ Latex core and covered in an ultra-soft bamboo quilting, our Commodore mattress is all about comfort and by far our most popular model. Available in soft, medium firm and firm, we have something for everyone. Our Captain Hybrid mattress is an economical way to enjoy the comfort of Latex and freshen up the stateroom. We start with a 3” base of hi density polyurethane foam and add 2 inches of soft latex and cover it in our plush bamboo quilting. It’s the perfect choice for guest bunks and crew quarters. Visit our website to get specs, size and pricing on all our selections of mattresses and toppers. Don’t forget to check out our vast collection of sheets from Egyptian Cotton, Bamboo and Sferra to find your desirable sheet set to go along with your new mattress! YachtBedding.com is indeed your one stop shop for all your bedding needs. Feel free to give us a call and we will be happy to assist you in your journey to make your stateroom, your dream room.